Bed And Breakfast4500 sq. 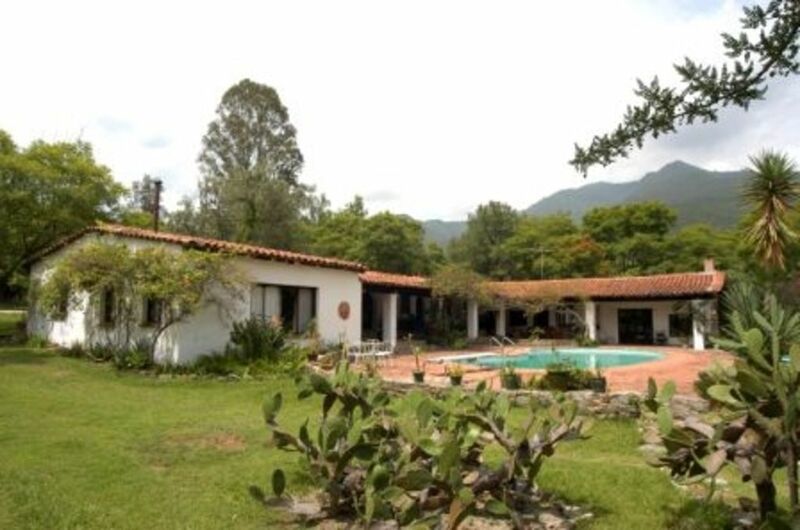 ft.
Casa Raab is located on a 40 acre nature preserve in the foothills, just north of the city of Oaxaca. The landscape has lush creeks, cornfields, agave plantations, mineral springs, an onyx mine... and wonderful views of the valley below. Although secluded and in a ranch-like village setting, it is just 20 minutes to the heart of Oaxaca. A stay at Casa Raab may include guided visits to traditional markets, ancient ruins, handicraft villages, mezcal stills, art galleries, museums and the city of Oaxaca. From individual travelers to medium size groups... from family reunions to weddings, workshop-seminars and retreats; Casa Raab and its staff can handle your every need. What to Do? : Visit archaeological ruins, handicraft villages, world famous markets, museums, churches, galleries, mezcal distilleries and the lively zocalo (town square). Go for long walks through the villages or in the foothills, take an eco-adventure or a short flight/long drive to Pacific beaches. Day-Trip Tours & most other transportation services can be arranged with us. We use a 15 passenger air conditioned van. Tours include handicraft village shopping for black pottery, woven tapestries, embroidered cottons & carved wooden animals. Mezcal Tours into remote parts of Oaxaca are our specialty. We also grow thousands of agaves and distill them into Mezcal, right here at Casa Raab! Amenities:: You will be served by our friendly Mexican staff, who live in the village and have been with us for several years. We are fully furnished, have a beautiful pool and offer laundry and maid service. Our great meals are prepared in either American or authentic Oaxacan style. Unlimited hiking and exploration are here on Casa Raab's 40 acres...... and all or this within a wonderful village atmosphere. - Transportation services are optional and may be arranged. The Raab family has been building the estate for over 50 years. We know Oaxaca as our home and will bring you into that sort of relationship with the area. We have lifelong friendships within the village and outside of it also in the greater Oaxaca valley system. With this background, we can offer good advise and assistance with planning and living your visit. Casa Raab is a 40 acre Eco-Preserve. We have been adding land and stewarding it for over 50 it shows. Animals and birds the birding racking up over 250 different birds here over the years. The hiking in the area is great and you don't have to leave the grounds fora good workout on the many trails. Animal friendly and willing to consider your pet's visit. We have lots of animals on site since we are an animal rescue service. Each Casa Grande Bedroom has a full bathroom. Our housekeeping staff will launder your towels and dirty clothes. Every view is of a different part of a rural landscape....no city sights from Casa Raab. Just out the driveway and a walk into the village of San Pablo Etla. You can gaze at the mountains from many places on the Casa Raab property. Good service 90% of the time. The Sala starts with a full bar, then the dining room (serves up to 15), then it drops to the living room with the fireplace, then finally drops into the game room full of things to do. La Casita renters can also use the pool. Casa Raab is a small ranch in the foothills outside of Oaxaca. We provide all services needed for your comfortable stay in the countryside. This includes transportation solutions, grocery shopping and banking assistance, menus and general planning for your entire stay. The Casa Grande has full WiFI internet access. Best to bring your own laptop for comfortable service. Most Cell Phones work well here, check with your local service provider before coming. Casa Raab is pet friendly...please let us know in advance if you are bringing a pet. You must like animals to be comfortable here...we still operate an animal rescue program and always have some nice dogs here guarding the place. The Casa Grande has a few steps, but is mostly handicap friendly. Please let us know in advance if you have special needs and we can discuss the situation. Oaxaca towns and villages still retain the spirit of Old Mexico; with fiestas, music and laughter in the air. Oaxaca is in the subtropical highlands, with breathtaking natural beauty, ecological diversity and rich cultural history. Exciting trips into the mountains can take you into world famous ecological zones. Other Activities: Animal rescue, mezcal tours, markets, handicraft villages, ancient ruins, music, museums and restaurants. Golf: There is a nice 9 hole country club with 20 minutes of Casa Raab. It has great locker rooms with steam baths, an Olympic size pool, and a good little restaurant. Clubs and caddies are available. It costs about $50 us for 18 holes. Morning hikes on the property are locally famous....and it is a surprise who shows up! One week of the hikes will get you in shape. Mezcal tours of the greater Oaxaca valley system will take you into a Zapotec world that hasn't changed that much in decades. Great people...great mezcal. Of course Oaxaca City has an abundance of museums, galleries, restaurants, churches....the works.